On 28th February, ASA Collective and Wideyed arrived in Derby and spent the next eight days there installing and then starting to run Mapping the Flâneur. Well… firstly, we download in chronological order the images people have emailed to us, and one-by-one we check they’re the right size, in the right colour space, and whether they have the photographers’ details embedded in the metadata. We then save them in a dated folder, adding numerical order and theme info to the file name, after which they can be uploaded to the mapping-flaneur.tumblr.com site. Following that, the images are transferred to a pre-prepared photoshop template according to the theme they’re a response to (so they’re in the correct position on the roll paper), and sent to print in the gallery. There’s about 7m worth of paper visible in the installation, with 30-35 printed images viewable at any time. Since the exhibition opened on 3rd March, we’ve been receiving 30-ish new images everyday, which is also roughly the number we can manage to process and print while the gallery is open to the public (11am-5pm Monday-Saturday, 12noon-4pm Sunday). This is working out really well, as it means that every image that’s sent to us is on view in the exhibition for at least one working day, and every day there’s a whole new set of printed images for visitors to see. In a previous blog post, we said we were considering installing a second printer in the gallery, to print doubles of all the images on 3”x5” index card sized paper. It was a lovely idea, but it turned out to be impractical. That said, all the images are still being separately printed in this smaller size each day, but it’s being done at home in London by ASA Collective’s Armando Ribiero, and he’s then snailmailing the prints to Derby so they can be placed in the index card filing cabinet in the gallery. In this way, even after the images on the roll paper have disappeared from view, they will still all be viewable in the index card filing cabinet. Well, that’s the theory… in practice, visitors to the exhibition seem to be taking these little prints away as souvenirs! Which is kind of flattering? 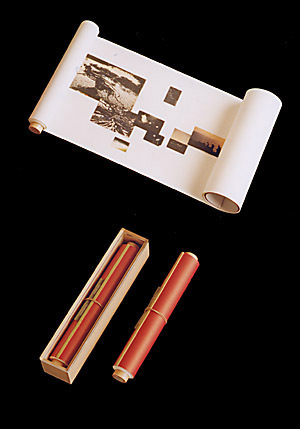 In a way, what we’re making is a set of giant scroll form books (like this by Masao Yamamoto [via The Space In Between]. As the exhibition is being ‘curated’ by the chronological order in which the images arrive by email, it’s been fascinating to see the correspondences between them that are being produced entirely by chance. We hope the little film above helps give an idea of what Mapping the Flâneur is like. amazing!!! the film does help and it has lucy’s amazing laughter as an end!!! love this! it is the first time I see such a long empty space within sets of pix on the same flânerie. Does the animal have hiccups? it is nice as it adds some kind of temporality to the body of work.